There has probably been a church choir in Crediton for something over 1,250 years. The choirs of the Saxon monastery and cathedral and of the early Collegiate Church, however, sang only plainsong (Gregorian chant). The Collegiate Church was under construction on its present site not much more than fifty years after the departure of the see to Exeter in 1050, and its early choir consisted of the eighteen Vicars Choral of the Church, who were for the most part ordained, and who also preached in the churches of the surrounding chapels and parishes. By the middle of the thirteenth century, the Vicars Choral had been reduced to twelve in number – one for each canon of the church, but the music they sang was still no more adventurous than plainsong. Bishop John de Grandisson, appointed Bishop of Exeter in 1327, was an enthusiastic advocate of the use of polyphonic music, music with melody. In 1334 he expanded Crediton’s choir by the addition of four secondary clerks (young men with adult voices) and 4 singing boys. Little of the music which they produced would have been for the enhancement of the worship of the Parish Church, then confined to the nave of the building, but was for the Glory of God and the benefit of the senior clergy. 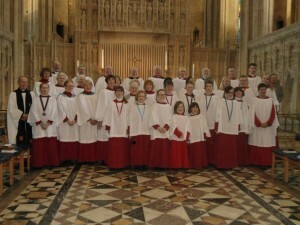 The pattern of worship in the collegiate church probably followed closely that observed in Exeter Cathedral, and the music, too, would have been very similar; the choir would have been capable of tackling polyphonic music in several parts and in structure was identical to that of the bishop’s own foundation at Ottery St Mary. All members of the choir were expected to attend the whole round of daily services (whether choral or not), from “morrow mass” of the wee small hours through to Mattins at around midnight..
With Grandisson’s measures of 1334, membership of the choir effectively had three tiers: the Vicars Choral, the secondary clerks and the choristers. 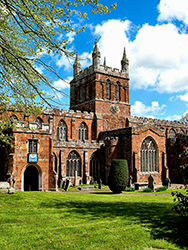 From 1365 the vicars and the clerks were housed communally in a dwelling called Kalenderhey (very similar – though on a smaller scale – to Vicar’s Hall in Wells Cathedral and Kalerdarhay in Exeter) which provided them with single chambers but with communal dining. This was built to the north of the Church (on the western side of the present car park) and was only fully demolished in the middle of the nineteenth century . The appointment of a clerk responsible for teaching the choristers in 1334 effectively established a small private choir school, in which a few boys learnt both plainsong and polyphony – we know only the identity of the last of these clerks, Philip Alcock, who gave up his post when the college was dissolved in 1545. Alcock was a former scholar of Lichfield Cathedral, whose setting of an antiphon to the Virgin, Salve Regina mater misericorde, is still extant (it has been sung by the choir in the recent past). Like young men everywhere, choir members got involved in some doubtful activities. In 1312, three vicars were convicted of fornication with women, one with his cousin. After the verdict one of them resigned, the other two agreeing to do so if should they ever be found guilty of the same crime, with the same woman! In 1414 Vicar John Lyghtfote came to blows with the treasurer (a senior canon), and in 1426 he had another fight in a churchyard in Honiton where he had become a chaplain. Until the Black Death in 1349, the Collegiate Church was able to maintain an almost full complement of Vicars Choral and clerks, but after that year finding suitable applicants to fill vacant posts became an impossibility, and from the mid C14th to the Reformation successive bishops’ registers show that the choir was depleted in numbers. The tradition of having four choristers continued, however, because over two hundred years later at the Reformation, the charter of Edward VI establishing the Parish Church of Crediton provided for “four King’s queresters” to be appointed. The later charter of Elizabeth describing them as the “Queene’s poore grammer schollers yt do help in the quere” affirmed this. The boys were taught by the Clerk to the Governors, Hugh Deane (who was possibly in minor orders in pre-Reformation times). 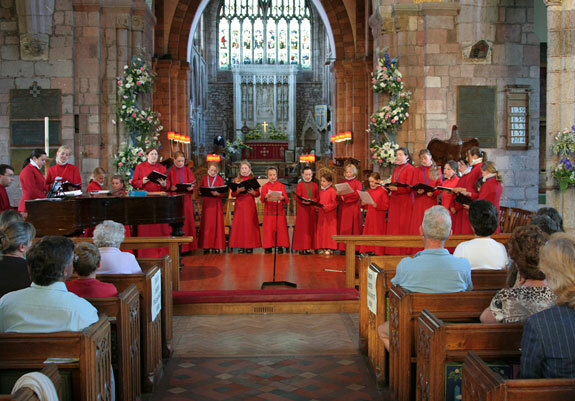 There is a long history of music making by the Church choir under the dedicated guidance of hard-working choirmasters. 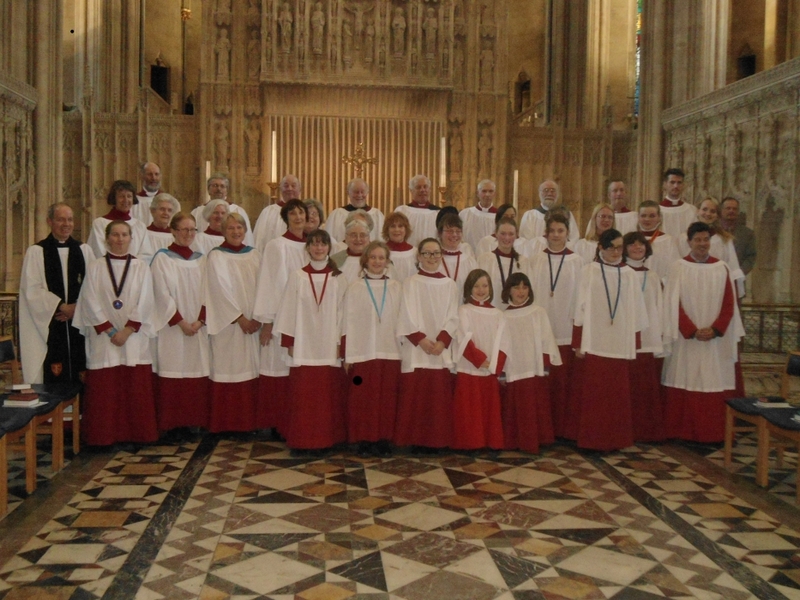 In recent years the choir has sung at numerous cathedrals and undertaken foreign tours to Holland, Germany and the United States.